My friends and I frequents Starbucks and Coffee Bean every time we meet. There wasn't a time that we don't go to either of these coffee shops after dinner or after movie. 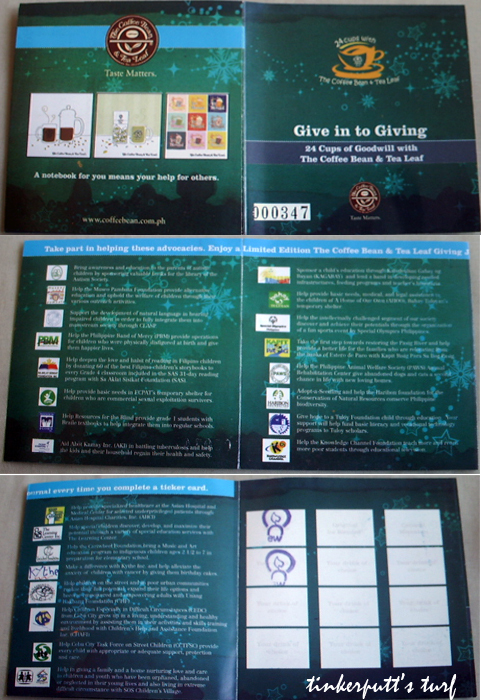 The Coffee Bean and Tea Leaf has a promo entitled "Give in to Giving with 24 Cups with The Coffee Bean and Tea Leaf"
Anyone can take part in helping to different advocacies. Every time you complete a ticker card you get to enjoy a Limited Edition The Coffee Bean and Tea Leaf Giving Journal. -- Any 9 Regular or Large Original Ice Blended, Coffee-based or Tea-based beverage. 3. Once all 12 drinks are stamped and completed, you can now claim The Coffee Bean & Tea Leaf Giving Journal. You may choose from any of the 3 specialty designed The Coffee Bean & Tea Leaf Giving Journals. A notebook for you means your help for others.